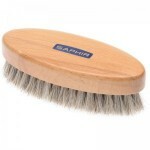 Saphir Oval Brush is cleverly designed to fit easily in the hand making it far easier to use than a standard rectangular shape. 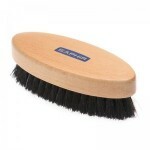 Made with 100% horsehair it will clean or buff equally well. Measures approximately 13.5cm x 5.5cm. Please note the wood finish and logo may vary slightly from batch to batch. "Nice sized brush, recommended. " "Super saphir. 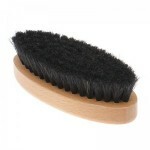 Very good for your clothes and your shoes, on your choice." Super saphir. Very good for your clothes and your shoes, on your choice.